I’ve been to lots of charity conferences over the past year – and I’ve noticed some trends. There’s tonnes of discussion about how charities can borrow from other sectors, particularly in digital and marketing spheres. There’s also an implication that charities are playing catch-up in terms of digital development. It’s undeniable many charities have limited resource, particularly in digital, but this doesn’t mean we should rely on other sectors to lead the way, imagining ourselves as riding on the coat-tails. One thing I took away from Society in the Loop, an event bringing together civil society and the social sector with the tech industry, was that society would benefit from charities gripping the reigns and becoming trailblazers in the digital space by playing to strengths we already possess – our understanding of, and connection to, the diverse needs of society. Despite the array of benefits digital innovation can provide, it can also reinforce existing inequalities. This comes when people don’t have the digital skills or financial resources to keep up with the pace of change. This inequality is furthered when developments are designed with the majority in mind. Though tech innovations can radically change lives, many parts of the tech industry reflect the same problems of society at large. There’s a lack of diversity, lack of representation of women and lack of consideration of the varied needs of a varied society. 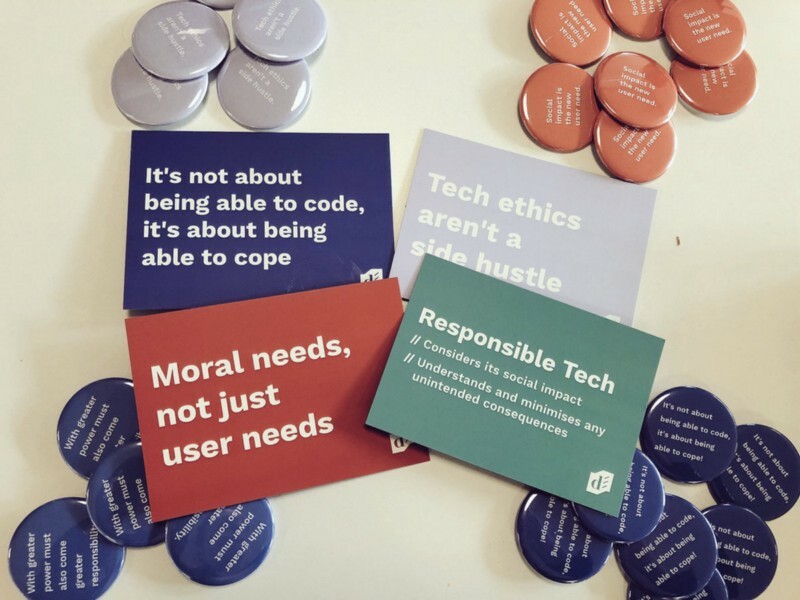 Tech needs to be inclusive from the point of design because, as anyone who has used a wheelchair/crutch/pram on the London Underground will know, inclusivity is long-in-coming when implemented retrospectively. Charities can help to alleviate the strain of such quick development by representing the people we support, the people who aren’t in the room. A good start is always to get those voices in the room to contribute to the discussion. To influence and engage in tech development, we need to understand the needs and challenges of our communities. We need to be strategic about how we choose to engage in the development that is happening around us. Just because a new tech development offers new opportunity, it doesn’t mean it’s right for our users. Before you jump into a new project, think about who it truly serves. Voice technology, for example, can be great for those with limited mobility. But users also need to have good hearing, be technologically up to date, as well as being in an area with good internet access and enough expendable income to afford a device. As Matthew Johnston from ThoughtWorks pointed out – it’s useful, but is it inclusive? So who are you really doing it for? A shiny new digital product might make your charity pioneering, but could also exclude a large section of the most vulnerable of your service-user group. That’s not to say we shouldn’t develop digitally. The impact we have through our digital work is a part of the impact we have overall. Further, we’re losing out on changing donor behaviour by failing to optimise our online giving platforms. Reason Digital estimated charities lost out on £1.5bn in donations last year because of high bounce rates on mobile devices. We can’t afford to continue to lose out so acutely. At the same time, if our work includes life-saving information, service awareness or even service delivery, solutions should be developed which factor in the risk of furthering division across the digital divide. Access to products and services should not be a luxury. When designing a new digital initiative, we should think about how it might help and hurt those who we aim to support at different levels of intersectionality – have you considered the breadth of your supporters, who’s experience will be diverse and personal? Have you considered people who are not well represented in your network currently? If we are engaging in something that excludes a certain section of society, is there a way to include them in the charity’s work outside of the project? During Society in the Loop, Josh Cowls urged us not to be distracted by the tech utopia silicone valley promises, nor the robot-led dystopia about which the Daily Mail frantically scribbles. While it may be endearing to look for the shiny new digital solution, he suggests that “sometimes the most boring solution is the right one”. It’s not glitzy, but it’s important. My concern is that we get so caught up in becoming ‘digital-first’, a phrase batted around often with no follow up about what that truly means, that we lose sight of what we are doing it for. If we are continually putting our users first in our own digital work, we are better placed to influence the course of digital change overall. “Technology is changing society. But society needs more power to change technology. So beyond our own work, a larger discussion is ongoing about how we can influence the movement overall. We should recognise the key insight we bring to this new phase of societal disruption – and be confident that we can feed into the discussion in a meaningful way, to make digital work for everyone. Find out more and get involved in the conversation. Molly is the digital assistant at CharityComms and a Charity Works fellow. Before CharityComms, she was studying for her MA in International Development. Prior to that, she directed, produced and edited film projects both in a corporate and not-for-profit setting in the UK and internationally.